The Ninth First Climate Refugees | Watts Up With That? International leaders gathering in Paris to address global warming face increasing pressure to tackle the issue of “climate refugees.” Some island nations are already looking to move their people to higher ground, even purchasing land elsewhere in preparation. 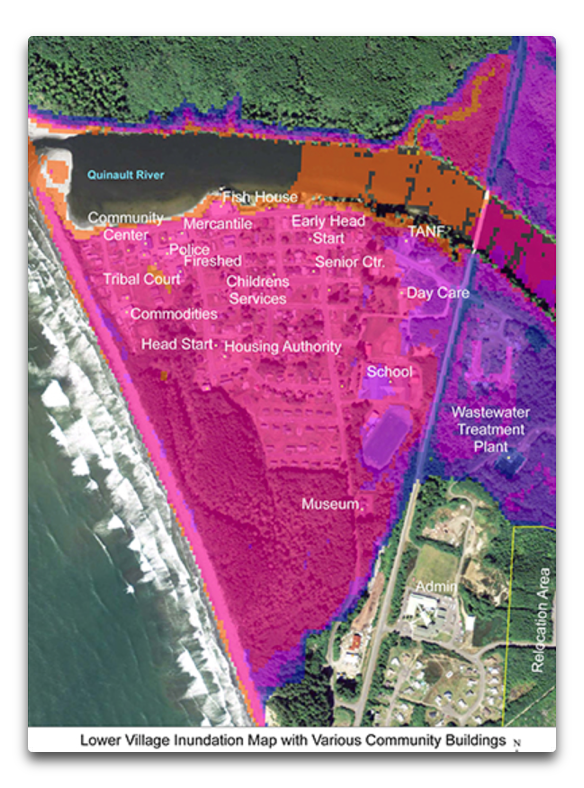 The Quinault Indian Nation, whose small village lies at the mouth of the Quinault River on the outer coast of Washington’s Olympic Peninsula, now relies on a 2,000-foot-long sea wall to protect it from the encroaching Pacific Ocean. Small, ramshackle homes back up to the modest wall of rock and gravel. Last March, Quinault Tribal Council President Fawn Sharp got a call in the middle of the night from an elder who lives in one of those homes. The U.S. Army Corps of Engineers repaired the sea wall, but it’s a temporary fix. A more permanent solution is on the table — but it won’t be cheap or easy. 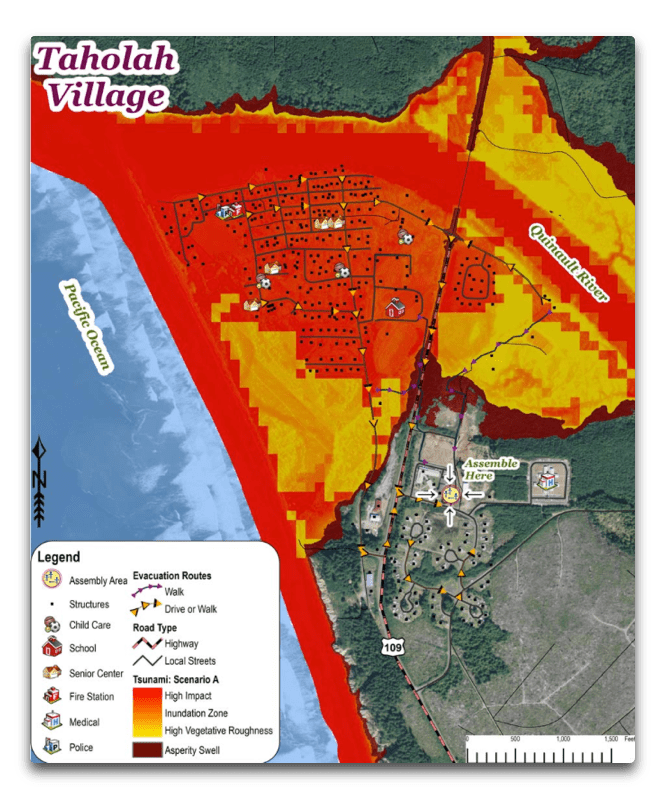 The Quinault tribe has developed a $60 million plan to move the entire village of Taholah uphill and out of harm’s way. That will mean relocating the school, the courthouse, the police station and the homes of 700 tribal members a safer distance from the encroaching Pacific. “It’s a heavy price tag,” Sharp acknowledged, adding that she and others with the Quinault will be turning to Congress, philanthropists and the tribe’s own financial resources to pay for the project. Hmmm … as you can see, even a one foot rise will do little to the town, doesn’t even make it in as far as the street nearest to the river. 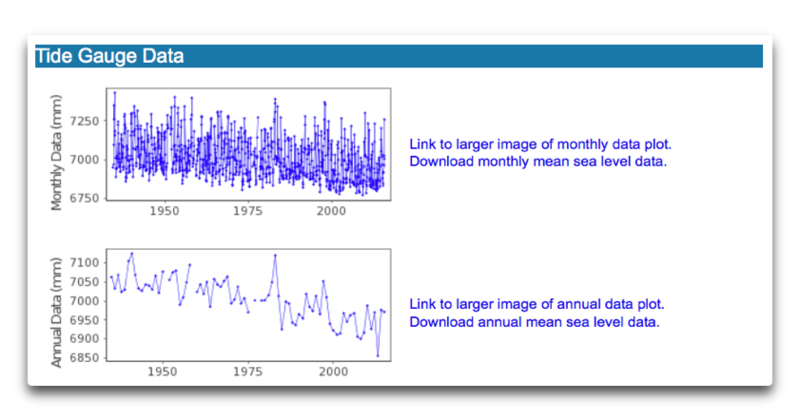 Ooops … according to the data, the sea level has been falling since the start of the tidal records … go figure. Since 1940 the sea level off of northern Washington has dropped about 15 cm. (6 inches). At that rate, how long will it take to rise one foot? So given that their claims of sea level rise are contradicted by the actual observations, why do the Quinault want to move? Well, more than anything it has to do with the upcoming terrifying tsunami that will strike the northwest coast. Is this an empty threat or a disaster movie scenario? By no means. Geological records indicate that the Juan De Fuca earthquake fault right off the coast has ruptured regularly throughout geological history, and is currently overdue for another major quake. And each of the big historical quakes has been accompanied by a huge tsunami that smashed into the coast. So the question is not whether a giant tsunami will hit Taholah, but when it will hit. Ocean acidification, hypoxia events, sea level rise, coastal erosion, tidal surge, and increasing severity and intensity of storm events are now occurring with disturbing frequency. Oh, please. Sea level is NOT rising, that’s a total misrepresentation. Nor have storm events increased in intensity or severity. Look, I have compassion for the Quinault. In addition to all the other problems faced by reservations all over the US, they are staring an upcoming tsunami in the face. In their shoes I’d want to move, and I’d be making all kinds of noise about every possible threat to try to squeeze money out of the various donors and government agencies. But other than the tsunami, the claims of danger are all smoke and mirrors. I wish them every success in getting the money … I just don’t like the misrepresentations in the process. My Request: Misunderstandings can be reduced. If you disagree with someone, please have the courtesy to QUOTE THE EXACT WORDS YOUR OBJECT TO, so we can understand the exact nature of your disagreement. [UPDATE]: In the comments someone asked about why the traditional people would live in a tsunami zone. My GUESS, and it is only that, is that the Quinault historically didn’t “live” anywhere more specific than their traditional homeland. Within that, my guess is that they had structures in several locations where they resided when they were harvesting the various foods available in different parts of that homeland. One of the locations would be the main area where they spent more of the time. If I owned their turf, I’d live at the ocean, for a simple reason—that’s where the most food is. Per Google Earth, that location is on the order of a hundred feet (30 m) above sea level, and it is also outside the model simulated tsunami range shown in red. Those old guys knew more than we might imagine. And indeed, that same area is near the proposed location of the relocated town, up on the highland. It’s the area at the lower right below, where you can see the real reason for the proposed relocation, and how little it has to do with climate change. Ooog … they have to move the school and the senior center and the police and the tribal court and the wastewater treatment plant … a huge undertaking. Their relocation plan is here (with an awesome banner at the top), and I wish them the very best in their project. When I saw this ‘news’ item somewhere else. I immediately thought that Willis would have something to say about it and I wasn’t disappointed . You could set up shop in Sedona. Make a fortune. This wouldn’t have happened if we hadn’t tought them how to build “Proper Houses”. they could simply have pulled up the steake of their Teepees and relocated accross the river to higher ground. I was under the impression that even reservation land was considered a separate soverign nation within the USA borders. If they want to move so bad, let them use their Casino Income and relocate their city within their own nation. Bryan, I’m afraid that wouldn’t have worked. The traditional residence of the quinault was the long house. The “old” village land will be leased out as as expensive waterfront vacation homes once they get the locals moved off.. Probably have to accept payment in patchouli oil. They didn’t use “tipis” on the Northwest Coast. They were building “proper houses” before the first Canadian fur trader made it that far west. As an side, the retreat of sea level really is an indication of increased risk of a major earthquake off the coast. After which, the coast WILL be lower, just as it happened in Japan. Then the coast will gradually begin to rise as the North American and Juan de Fuca plates continue their long, slow dance of subduction. Bloke: First came up in December 2015. You’re not ready for Sedona. So move the whole damn place. They moved the entire city of Valdez Alaska after the 1964 9.2 earthquake. One proviso. ALL of that peninsula that is threatened by an imminent tsunami, will be returned to nature. NO human trappings of any kind allowed on that peninsula. Fro starters it is too damn dangerous to even allow hikers to visit there. So return that land to wilderness and build the Indians; excuse me, that’s Native Americans far enough away from there to eliminate any conceivable Tsunami Tsenario. Why did their ancestors ever build there in the first place ?? G…Why would you be issuing a “proviso”? And why would you want no one to hike there? Or am I missing an obvious sarcasm? Say what? Why on earth would you want to do that? Where does that come from? What does that have to do with anything? Something cataclysmic happens along the whole coast every 300 to 500 years, and you advise fencing the entire coast off from the world? Say what? Dang, George, you might want to walk outside and enjoy the morning … what is the source of this bitterness? A thousand human beings sharing the continent with us have to uproot everything that their parents and grandparents laboriously but unknowingly built in a danger zone, and rebuild it out of harms way. And unlike you and I, they can’t just move. It is their ancestral homeland, the land of their people. Oh, they could move to San Francisco, but aaah, the pull of the land and the history and the family, few will want to. So they are faced with saving their village, a thousand people, to move a whole city. How about starting from a position of compassion for the huge task ahead of them? As to why their ancestors built there, I suspect that they didn’t. I’d bet good money their camp was at the top of the hill as I mentioned in the head post. For one thing a coastal village can’t be defended. It’s always vulnerable to attack by sea. So around the planet, coastal villages in early times tended to be on hilltops up away from the water, to prevent surprise attack. And for another thing, they’d have folk memories of the last tsunami. In pre-literate societies these stories are told and retold, generation after generation … but in this case, in time that knowledge was lost, and JUST LIKE THE MELANIN-DEFICIENT FOLKS they built in the danger zone. Well Steve; it seems to me from my experience, that people who complain about what they have got (for whatever reason; justified or not), when offered a substitute, then require that they also want to hold onto that which they are complaining about. I’m not judging whether they really need to move; I don’t know enough about the hazard. But if they are to be moved because of that hazard, then we shouldn’t be then sticking some other unsuspecting dupe, with that which is presumably still hazardous. For example; all of the temporary San Francisco landfill properties, which all fell down during the 1989 Loma Prieta quake. Or those folks living underwater in N’orlins, who didn’t realize that their house is at the bottom of a big swimming pool. Well Willis, I guess you will find bitterness wherever you want to look for it. The specific situation you described of course is an issue for those people. And yes I’m sure their ancestors were unaware of the geology of the place. That doesn’t alter the fact that people will insist on returning to the place of their mishaps, and ignore the hazards. Peoples still build on the slopes of Mt Etna. Hollywoodians keep on building and rebuilding year after year, after the forest fires, and mudslides have demolished last year’s hillside mansion, and in the exact same place. But none of that will of course affect my home insurance. I pay for flood insurance on a home that you couldn’t flood, if all of California’s annual water came down in one continuous rainstorm. But I’m required to pay for it, so FEMA can allow people to return to the same site year after year, despite the hazard of that site. That was the bit that got me they are doing all this around a quake of magnitude 9.2. Anyone got odds for being hit by a meteorite vs a 9.2 quake, I am thinking they may have to take to space to get somewhere safer. If you stand on the Oregon coast for five hundred years, your odds being killed by a tsunami from a 9.2 quake are very high. And you’ll be tired of standing. There have been no less than 19 quakes over 9.0 in the last 10,000 years, or about one every 500 years. The question is not if but when. Your odds of being hit by a meteorite on the other hand, are approximately zero. The question is if, not when. If you stand on the Oregon Coast for 500 years, the odds are pretty good that you will be dead, even without a 9.2 earthquake. A close friend of mine was living in Coal Gables Florida, when they had one of their most recent Hurricanes, I think it was Andrew, but I’m not sure of that. It did a lot of devastation around Homestead. and the keys as well. Neighbors of my friend (next door virtually) had substantial flood damage in their yards, and a lot of tree and shrubbery damage. My friend had a small tree blown down, but had no water damage at all. When I drove to his house not long after that event, I noticed the bump n the road as I drove along his street. It seems his yard was a bit less than a foot higher altitude than most of the neighborhood. There was enough vegetation in that part of the Gables to inhibit the direct winds blowing surface water all around. So just a few inches of altitude left him high and dry. The indians I know call themselves “indians” and laugh at me for saying Native American. The tsunami generated by those west coast super-quakes can be gigantic, especially when they get squeezed by the shape of a valley, (somewhat like the Bay of Funday squeezes tides and makes them larger). The huge waves can slosh right up a valley far higher than many even dream. This may have happened to various tribes back around the year 1300, and some survivors took it as a “sign” they should leave and never return. Evidence? Well, the Navajo and Apache have a language that is traceable to the Pacific coast (and then up to Alaska.) They arrived in the desert around the year 1300. And some clans have a taboo “thou shall not eat fish”, which seems odd for desert dwellers. Not the strongest evidence, but interesting. The main point is that, if a 9.0 quake isn’t bad enough, the tsunami afterwards can be even worse. Living on a barrier island does seem to be a common element. Those move with the ocean, regardless of sea level rise. Right, when you live on land compared mostly of glacial till, it is stupid to not expect it to erode away over time. Most of the islands off Maine are covered with 10-40 feet of glacial till and erode constantly. The biomass growing on the surface tends to expand laterally and create a curtin over the edges of the till at the island edges, but wave action still erodes material away from under this overhang. So, the natives having to move is an perfectly predictable eventuality even without any sea level rise. The current sea level rise rate is actually a bit lower than the consistent rate of rise that has ruled for many years. I do not think that “refugees” includes people who are suffering absolutely predictable and normal effects of nature. It would be similar to claiming major damages from the climate because I have to paint my house every twenty years—no that’s normal weathering and part of the cost of living—the cost of the painting is $15K which I categorize as a major cost. Thats not a barrier island. Barrier islands are features of submergent coastlines. This is an emergent coastline. OT: Willis, I read your response to me about Federal wages but the thread was closed. I just wanted to point out one thing you may not have considered. While your “raises” were accurate, that is only how much the steps increase by each year. Federal employees still get step raises each year (dictated by length of service) and each level has about a 5% delta. So even with turnover (replacing a long time retired employee with an entry employee), the percent a federal workers salary rises is significantly above the private sector (I know in some states, state workers get no raises – not step or COLA). Phil, the numbers were the actual Federal pay raises, year by year, for the Obama period. Three of those years they got no raise at all. So what did they do during those eight years to deserve any raise. I have had NO raises during the Obama years; well no pay raises. I’ve seen price increases of as much as 50%. The 2017 Federal Social Security cost of living (COLA) will be a staggering 0.3%, less increased deductions for Medicare Premiums. We are asked to believe that there has been no inflation during the Obama years; yet the national debt had increased by tens of Trillions of dollars; more that ALL of the increases caused by ALL of the Presidents who preceded him; yes that chap who promised (the Congressional Democrats) ” If you like your plan, you can keep your plan; if you like your doctor, you can keep your doctor. ” Everybody will save about $2500 in medical costs. I say CDs, because not one Republican vote was cast for any of that. Now the Military; that is something else. They need a pay raise. Seems to me they are about the only Federal ” employees ” who should be paid at all. The COLA for many years now, if we got one, was on the order of 1 -1.5%. A hard working person in the middle of their payband could expect 1.8 – 3.6 % performance raise with a good review. If topped out this is converted to a one time bonus. We (NAVAIR) are having problems attracting AND keeping solid young engineers and scientists. It’s all too common to have private industry steal them away after 3 -5 years – this is almost always based on better pay. BTW, I just retired at age 62. I’m on the new retirement system – FERS. Most my age or younger are on FERS. The benefits are very simple 1) I paid Social Security tax, therefore I pull those benefits. 2) The gov has a 401 plan called TSP. I have taken advantage of that. 3) There is the pension, which is basically 1% times the high 3 years average salary times the number of years of service. For me with 32 years I’m getting about 29 percent of my last paycheck. I signed up for this arrangement in 1989 – I did 5 years active duty, of which I had to pay lump sum the SS tax plus interest I didn’t pay at the time. i missed the CSRS by a couple years. This was a much better system for the retiree once retired, but it tended to lock people into staying in the gov, I think a lot of the general discontent expressed about the federal retirement system is based on the relatively high benefits of CSRS system. The 2017 COLA for SS is 0.3% less increased medicare premiums. Time may prove your choice superior. The problem with CSRS is that the government did not put any funds into retirement plans. Every CSRS retirement check comes right from the Treasury, not payments from existing workers. Congress has a very bad habit of ignoring or reducing payments to island plans without current direct participation. Retirees do not get the same Union representation that workers can expect. The worry with CSRS is that Congress will seek ways to cut that expense back. The short time that I worked for the Department of Agriculture in the late ’70s, they made Walmart look generous. we were hired on a term basis – I was a 180 day hire – but amazingly worked full time for two years through back to back hires. That is, they dodged all the “benefits” issues in precisely the same way Walmart does. We had no benefits of any sort, and were on call as drivers during forest fires. We also paid income taxes (state and federal) and SSI. I once calculated, just for fun, how much of my wages my wife and I paid myself. The result was depressing. And with the ocean acidity, if it’s not on the other side of neutral it ain’t acid. Libs sure seem to care about Native Americans when it is politically favorable. Otherwise…??? That’s not really true. pH is a relative measure of the ratio between H+ (or H30+) and OH- concentrations. So, even water with a pH of 14 has acidity — just not very much. Okay. I admit that there are hydrogen ions in a pH14 solution. But the solution is still highly basic. There isn’t ANY acidity unless the number of H+ ions exceeds the number of OH- ions. Pure water (H2O) ALWAYS has exactly the same number of H+ and OH- ions and gets a pH of 7. Just don’t rely on the State of Washington for the hazard map or any related expertise. Wow- using this reasoning, it is time to move Victoria, Vancouver and Seattle. No problem! I have a neighbor whom I have a friendly regular debate with about sea level rise. She is convinced of the chicken little scenario, and I am, out of compassion as she is a nice person, trying to convince her otherwise. I have used this NOAA chart, and even some of the tidal guages that show slow steady rise on the East Coast. Has anyone had any success in breaking through to someone completely sold on the fast rise any day now scenario? When I showed her the guages, her response is some “scientist” is convinced that models are better than the actual data, since catastrophic ice melt is around the corner. I am almost at teh point of giving up, but well I feel bad for her. I should add that I have tried using the math: how much ice NASA says we have, vs total INSOLATION, and thus how long it would take worst case scenario to melt that much ice, etc. Nothing works. Hi Mike_GenX my 84 year old father has plenty of cliché sayings. One of my favourites is, “There’s no hope for the hopeless!” Along similar lines you might say, “Never give a sucker an even break!” It’s just a waste of your time and effort in the long run. They drag you down to their level and the beat you with experience. @ Hans, I have always love that statement,it is more true regarding ” Climate Change” followers than I have ever seen before. My grandfather was told by an “economics” professor while he was in college that the reason why we needed taxes on banks was because if we didn’t pretty soon banks would have all the money. You see, banks lend money, at interest, so when you pay back the loan, you pay back the principal and interest. These means the banks have more money than when they started. Repeat the process until banks have all the money. I tried to explain to him that banks use the money they earn on interest to pay things like salaries, utilities, rent, insurance, etc. His reaction was the old saw about “lies, damn lies and statistics”. My uncle also once declared that until the government could provide tutors for everyone, private tutors should be outlawed. It just wasn’t fair that the rich could afford a better education for their kids. Your neighbor believes Chicken Little likely because she senses a net benefit to her for doing so. If she believes “bigger government is the answer (whatever the question)” and pays less tax than you do, your compassion for her is misplaced. The climate models are predictively useless, Mike, beyond a smidgen of a scintilla of a soupçon of a doubt. Let your nice friend be reassured: they don’t know what they’re talking about. Literally. Just remind her, every time the weather forecast is wrong, that the weather service modeled the weather. To help the point along, make sure she reads the weather ten days to three weeks in advance. Most of their generic models default to averages beyond a few days. Then she’ll start avoiding you. Sea level falling means land is rising. That is evidence of the stess buildup on the Cascadia subduction zone fault discovered less than 40 years ago. Average time between earthquake/tsunami ~270 years per the geological record. Last rupture was Jan 26 1700. The tsunami hit Oregon Washington with a wave up to 100 feet high (>3x Tohoku). Vertical land displacement averaged >10 feet along the coast. Same tsunami hit Japan one day later, which is how we know the exact date and time. Strength depends on partial or full fault rupture. Partial, ~8.5. Full, >9. FEMA planning is >15k deaths (most likely several hundred thousand, most from tsunami, worst case up to 1 million) and up to 3 million structures destroyed- basically everything west of I 5. Is overdue. Tribe needs to get 100 feet higher. But, so does much of Salem and Portland Oregon and Tacoma and Seattle Washington. Almost nothing being done, of course, in the face of only when, not if, uncertainty. Read The Really Big One in the New Yorker. Easy google one click find, great read. I am waiting for this. My home is 600′ asl, overlooking the Willamette valley — soon to be ocean-front property! Well as I recall. I5 runs right up the Willamette Valley. It would be a hell of a tsunami to make it over the mountains into Willamette Valley. The Columbia river flows west from Portland; at least it used to when I lived there. Most rivers run downhill, because it’s easier than flowing uphill. So if you model the Columbia river as a two dimensional exponential horn, who knows, a 100 ft. tsunami wave at Astoria would probably build up to 1,000 ft. high by the time it gets to Portland. So it would likely flood that place up at Crown Point. I’m with you on ”the big one is coming” and also on ”sea level rise is well overcome by land subsidence”. But you got kind of full-metal-jacket on the rest of it, I think. FIRST, along the Oregon & Washington coasts, there are a number of “ghost forests”, dating back up to 2,300 years ago (by simple Google search). The truth is that the WHOLE coast was once quite a big higher it seems, within that same 2,300 years, essentially up to 10 meters higher. Now whether anyone can say that the whole coastline is gradually subsiding, punctuated periodically by overthrust-fault compression raising and earthquake sudden subsidence, is is some good research to establish. It seems so. But whether millions of people are going to perish, all depends on how fast the overthrust compression is relieved. In Alaska, for instance there are overthrust faults that rupture (if that’s the right word) so slowly that no physical earthquake is associated with the adjustment. Days-to-months of ‘sudden’ (in geologic terms) release of energies amounting to M9+ if it were on human timespan scales. How do we know? The Ghost Forest phenomenon again. Areas once quite dry rendered into swamps with no one really watching. Evidence from centimeter accurate satellite RADAR interferometry. YES, we do know that the Cascadia fault goes “blam” every so often. 270+/-100 years, with sometimes significantly longer gaps near 500 years. These much longer gaps in turn explain many (but not all) of the ghost-forests: it takes like 500 years to finally compress the fault enough to bring PRESENTLY submerged “ghost forests” back up above the tides. For reforestation. To make another ghost forest, during a truly gargantuan earthquake. M9.5+. Yep. It could be a big one. But it also could be a more nominal one, if it happens near now. Gg, nope. Just reporting what is publically available but not in the MSM. Sadly, Cascadia truely is worse than anyone thought. So much so, almost nobody wants to truthfully report on it. Dig into the geology reports and the damage estimates based on past ruptures. Your ghost forests were submerged in seconds, not years. They did re-emerge over centuries of the next stress build up. Remember, nobody knew any of this in 1980. The big Cascadia insight emerged only in 1987 and was only confirmed (via Japan) in 1996. The 1964 Alaska quake was only a 9.2. I lived in Coos Bay Or. for 10 years earlier, Port Orford. Port Orford had a 7.0 back in the mid 1800’s. make an earthquake preparedness brochure. Met with stiff resistance from the Chamber of Commerce -and emergency services… Gave up. Salem is over 150 miles upstream from the ocean and nearly 200′ above sea level. Portland is a hundred miles upstream from the coast. By the time a 100′ Tsunami reaches Portland friction will have reduced it to less than 10.’ Portland has lot more serious issues in the event of the Big One than a tsunami. Like the tanks for holding all the oil shipped to all of SW Washington, Oregon, Eastern Washington, and Idaho is located on filled swamp land to the west of the Willamette river. (do I hear liquification?). The Colombia downstream from Portland will be a river of fire for weeks afterwards. And then only two bridges are expected to be usable after a 9+ earthquake. Thanks for the search instructions. Yes, “The Really Big One” in the “New Yorker” is a great read. When the earthquake does hit, individuals will have just minutes to make it to higher ground. When the big one hits you will have seconds to put your head between your knees and kiss your A*** goodbye. Don’t bother with the higher ground; it will come down to meet you. There were a couple of Discovery channel shows about geologists digging hillsides along the North West. On the ocean side of the hill, they exposed huge deposits of sand, some were meters thick. On the back side of the hills were rubble piles of trees and branches mixed in the mud. According to the geologist doing the research, he said it appeared that the tsunamis went over many of the coastal shallow hills. It’s possibly their innate honesty that held the tribe back from filing their QIN Strategic Plan with the required, if dubious, budget quote to green’s climate deity earlier. It’s a bit of a shame they couldn’t have tried earlier. I sure would feel better that a Native American tribe got moved on green funds, rather than watching the funds get paid to gavinator, manniacal, trenberth and so many others. Maybe the climate defrauders should pay penalties towards worthy causes? The allure of free climate cash is a powerful one. Where is their moral compass though? What happened to the “noble Indian”? Sheridan had an opinion on that. I do not agree with him per se, but certainly there are some of them that I would apply the phrase to. Noble Indian? — Are you talking about Tonto or Hiawatha? Iron Eyes Cody – he is was actually Italian who just loved the mythos of the American Indian. I read somewhere that the guy in this commercial has as much Native American blood as does Elizabeth Warren. What happened to the “noble Indian”? Sorry Bruce, never was one. If you can see through the modern revisionist excuses for the Native Americans arrack you can get good look at how violent and cruel they were. The Jamestown Good Friday Massacre 1622. They came close to roanoke(ing) rhe coloney. Interesting revisionist history by the conqueror. What brought this upon those poor colonists? Maybe this explains. Colonist friendly actions towards the Powhatans the following year. “In May 1623 the colonists arranged a spurious peace parley with Opechancanough through friendly Indian intermediaries. On May 22, Captain William Tucker and a force of musketeers met with Opechancanough and other prominent Powhatans on neutral ground along the Potomac River, allegedly to negotiate the release of the other captives. But Tucker’s objective was the slaughter of Powhatan leaders. After the captain and the Indians had exchanged ‘manye fayned speeches,’ approximately 200 of the Powhatans who had accompanied their leaders unwittingly drank poisoned wine that Jamestown’s resident physician and later governor, Dr. John Pott, had prepared for the occasion. Many of the Indians fell sick or immediately dropped dead, and Tucker’s men shot and killed about 50 more. Some important tribal members were slain, but Opechancanough escaped, and with him went any hopes of a quick return for the captured women. Between May and November of that same year, the colonists ravaged the Powhatans throughout Tidewater Virginia. “The English arrived in 1607, forty-five years after the Spanish. Their colony, Jamestown, was a business enterprise funded by the Virginia Company for the purpose of finding gold. The English colonists were not adept at farming in the North American soil and climate and lacked the skills for surviving in unfamiliar territory. Many died of starvation. During this early period, the Powhatan people took pity on the colonists and gave them food to help them survive. Native Americans up and down the coast were literally exterminated by colonists. In the Carolinas, colonists would set fire to villages, then shoot everyone trying to escape the fire. Such nice people, those colonists, and the people who take glee in their exploits. I’m pretty certain the Quinault would get plenty of relocation and reconstruction money after the tsunami hits. In the mean time stop investing in new infrastructure at the towns current location. BTW the coastal natives of the northwest have been inundated and buried by landslides and tsunamis caused by seismic forces throughout their history. I guess climate change is causing seismic activity too now. so sue me.. Me want’em bucks for bigger wigwam with a view on the hill. And when the quake and tsunami inevitably hits, the map will be far different than inferred by hypothesized change owing to a 1′ rise in sea level. How will you be able to tell? It will be buried under 2 feet of volcanic ash from the caldera explosion. Now THAT is warming. Accelerating sea level rise – another illustration of “fake news”. If anybody is going to start censoring, how about this. This is were Willis is good. Don’t care to hear about his “amazing” life adventures. 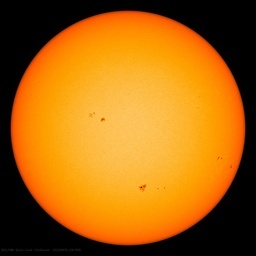 And…perhaps he should keep an open mind…that the sun might have something to do about climate. But this was a nice observation. I agree with previous posters about the big quake coming eventually. Gonna be a lotta sea rise with that. There has been a lot of quakes around the pacific rim of late – have a look at the extent of sea level rise at Kaikoura(N.Z) lately and the mighty chasms opened up in the vicinity of the faults nearby – so your ‘big one’ could well be near. Recent burst of quakes — Close approach of the moon? Suggested by some. Moon now moving away, less quakes? But in 70 years +- it will be looping back in. Most of us will be gone but it’s an interesting hypothesis … but low correlation. Hi Willis I think you are correct on the “huge tsunami” concern. Many areas in Washington and Oregon are trying to implement evacuation plans. Looking at the map, it is an exercise in futility. Note the one crossing of the Quinault river. The warning is going to be about 15 minutes. How are you going to get 1000(+) people out of a tidal flat that is on both sides of the river. Sixty percent of the Quinault live in this town. One last point to all, try to imagine being in a northwest pacific town like Taholah and the “big one” hits. Oh yeah, and its 1:10 AM in the morning. They really need to move. Mike I agree they need to move right now or at least ASAP. I looked at the plan that Willis’s link provided earlier, it shows they have to cover about 500-600 yards to get to higher ground as it sits today. After the initial quake ( which could last for minutes i think they’d have enough time (15 minutes) to cover that distance . But the problem is going to be, are the escape routes in good enough shape to be able to do that and are people in good enough physical shape as well. I until year & a half lived in northwestern Oregon, Sheridan-Newberg. Spent a lot of summers on the beaches, winters too. Loved to go for the storms. Aways picked spots high up on the cliffs. Needless to say I don’t think their evacuation point is high enough. Any tsunami from a 8. or better earthquake will go right up the river and fan out. And you don’t get just one. Anyway just my two cents. Also there are other issues like soil liquefaction. The Straits of Juan de Fuca are incredibly deep with a sharp dropoff from the coast. There is no continental shelf like on the East Coast. The tides are also very large. The can rise 6-8 feet between low tide and high tide. For instance, today the high tide is 8.6 feet and the low tide is -0.5 feet. Entire bays drain during low tide and convert to mud flats. I’m from Alberta, so probably shouldn’t comment on tides, but I think most places get 2-3m tides. So the 9′ tide mentioned isn’t that large. For ‘incredibly large’ tides, check out they bay of Fundy. They can get tides of over 14.5 metres (47.5 feet). At low tide in St. John, the mud flat is so large, you can’t even see the water. I used to do design work around Vancouver, BC before moving to the prairies – 16 foot tide range plus storm surges and waves. Each area is affected by the geography. That experience designing coastal structures makes me chuckle when I see people worrying about 2 mm per year changes in overall sea level. Heck, many of the structures I worked on moved way more than that due to being built on unconsolidated deltas so there was continual “maintenance” adding material and/or preloading to reduce the movement (note “reduce”, not stop). That being said, the Pacific Northwest has a very steep dropoff. When I was in the Navy, we could submerge in the Straits of Juan de Fuca, but we had to travel several hundred miles in the Atlantic before reaching an appropriate depth. The Quinault have lived on their little spit of land for thousands of years. Assuming this is true and they are not Johnie come latelys, they should have suffered numerous tsunamis in that time. This begs the question why do they still live exactly there? After the first devastating tsunami wise people would immediately resettle on higher ground, beyond the reach of the killer waves. I suspect that they were once more migratory, camping close to the ocean in summer, moving more inland and uphill in winter. Then we came along and confined them to their summer camp. Maybe they are just trying to get even by using the bogus threats of CAGW to their own ends. They certainly would not be alone in this. Pamela, my GUESS, and it is only that, is that the Quinault historically didn’t “live” anywhere more specific than their traditional homeland. Within that, my guess is that they had structures in several locations where they resided when they were harvesting the foods in the area. One of them would be the main structure where they spent more of the time. It is my understanding from studying the ‘First Nation’ histories here in the Pacific NW that all the tribes were basically nomadic and routinely meandered up and down the coast – transport by long boat – limited only by food supplies and by conflict with other tribes. Surely the accumulated tribal knowledge instructed them as to appropriate locations for their temporary residences. And I’m sure that same knowledge accounted fro the need to allow for both climate change AND tsunamis’ since both phenomena have been around for thousands of years. In fact the tribes have a very long and intimate experience with those phenomena. It is therefore unlikely the current dwellings are in any significant risk from this side of nature. Willis, I expect you’re correct that the Quinault didn’t have a permanent village for a millenium at the site of their present town. If they had, there would probably be one or more huge middens composed of mollusk shells, animal bones and who knows what else somewhere in the town. And that’s ignoring the tsunami issue. If there is a better place for it ,mods just move it there. To me it was just a great belly laugh. Did anyone see on the media outlets that Algeria, Morocco, and now Saudi Arabia have had snow this month? In Saudi Arabia snowfall came when temperatures dropped to -3 ° C in Al-Jawf region, as well as in northern -1 Qurayyat, according to the “Saudi Gazette” newspaper. Or that Iran’s citrus crop has been destroyed by cold weather? Or that totally unseasonal snow has happen in Tokyo this past month? I wonder why not? Too much Trump bashing to do? My ancestor Michael Westhaver from Lutzelsachson left the Palatine of the HRE because of the effects of the Maunder Minimum. Weather was so poor for so long they we starving. The German Emigration of the early 1700s is famous. Queen Ann of England resettled 30,000 Germans into Pennsylvania, Ohio, etc. …it was global cooling… and it had nothing to do with human activity. Good for you, Willis. The truth here is pretty simple. This ‘tribe’ is trying to do what ‘melanin challenged’ interlopers’ of Oregon and Washington should be but aren’t. My guess is the ‘assemble here’ location was the original location of their permanent long houses, and the drift down to the shore was encouraged after the reservation treaty, perhaps because the settlement is a fusion of three tribes and languages, only one of which would have had that tradition in that location. In the recent research on Cascadia fault there is a fascinating set of papers on the oral traditions of the Natives before and after fateful 1700. From Oregon up to BC. Whole villages/tribes disappeared, and that is part of their oral tradition. Discounted totally until Cascadia was recently better understood. The old ones were wise. Their oral traditions were based on fundamental truths. The “drift down to the shore” might simply be the result of folks not wanting to walk up hill at the end of the day to the houses while lugging big baskets of clams or dragging a seal carcass. With three centuries between seismic events and a poor physical understanding of the great inundation the ancestors speak of, beach front property would probably look pretty appealing. Even today when we should know better, we’re cheerfully building all sorts of infrastructure worldwide way too close to the ocean. The have a VERY lucrative gambling operation. http://www.quinaultbeachresort.com/ Perhaps they could tap those resources to fund their needs. Why do that when under COP21 you can claim climate mitigation and get your share of $100 billion/yr. Tuvalu has no honesty complusion. Fiji has no honesty complusion. Why this tribe now? Been there, got a ball cap with Q on it. Great place to park the motorhome. Here is something new that is SO cool. Animated Google Earth images. Showing the last 22 years of development/changes in a particular location on Google Earth. It will open over Miami and show you the amazing growth of Miami since 1984, but if you type in “Tahola Washington” into the search bar, it will rapidly move over and then focus down on this town and give you an amazing animation of how this community/area has changed over the last 22 years. Naturally, hard to see any sea level rise. But, it looks like they have been doing all kinds of clear-cut logging all over the reservation. Like a LOT. So concerned about the environment etc. Definitely Bookmark this page. It is awesome. And we are going to use it over and over again for glacial retreats and moving calving glaciers etc. All the Antarctic and Greenland glaciers etc. show up pretty well (some not though). Too bad there isn’t imagery for the whole earth (Whole Earth?). Are you missing any particular place? There is also a good record of things greening. looking at my acreage year by year in the “pause” mode it appears there are some repeated pictures, as if not everything got photographed every year. Still this is much better than the “time travel” mode of Google Earth. Bill, you are getting old! It is 32 years! Great find however! Thanks! If the people of Taholah are worried about tsunamis, then perhaps so should every coastal city from Neah Bay to Eureka, California. The entire coast between these points was hit by a large tsunami in January 1700 and studies by Brian Atwater have shown that the recurrence interval of such events is about 300 years. They are set off by earthquakes accompanied by a couple of meters of sudden dropping of the land when the N. American plate moves over the Pacific plate. The geologic record of such tsunamis is preserved in drowned forests buried in mud at various places along the coastline. Some of the best places to see the buried forests include tidal channels near Willapa Bay and several places in Oregon and northern California. I’ve been to the ones near Willalpa Bay with Brian and the exposures of tsunami deposits along the tidal channels are remarkable. The earthquakes and tsunamis were most likely very similar to the 1964 Alaska quake and the 1961 Chilean quake which were both magnitude ~9 on the Richter scale. When Brian was studying the tsunami deposits near Willapa Bay, he dated buried trees from several tsunami deposits, including the last one at 300 years. He then went to Japan where he looked up historic tsunamis and found one that was historically recorded in Jan 1700 AD but didn’t appear to be associated with any seismic activity in Japan. Apparently, it came all the way across the Pacific from North America and that appears to be the date of the 300-year old tsunami at Willapa Bay. The 300-year recurrence interval of coastal tsunamis means that we are due for an near 9 magnitude earthquake along the coast with an accompanying tsunami anytime now. If you live along the west coast, pick out your high ground now! DE, Nice restatement of the basic tectonic facts. Only question is partial or complete rupture of the fault. Based on land vertical distortion, full is again likely as there have been no intervening partial reliefs. The 300 year interval is based upon some questionable correlations of turbidite sequences. The plate-wide events with good confidence in correlation between cores is more like 1500 years. Don’t ever let actual data get in the way of alarmism. Not just turbidites. Tsunami overwash sands contain datable carbon, and crosscutting relationships of sand and mud volcanoes further support THOSE records. 300 years comes out shining on that account. And if that is the case, A big one is due. Don’t let careful geological study get in the way of some good rhetoric. The one big onshore record was 300 years ago no doubt. The multiple events are seen in the offshore turbidites. The onshore record you refer to is far too incomplete to come up with an average time interval. No it isn’t–it is solidly based on stratigraphy and 14C dating. A typical sequence (from bottom up) is drowned treed buried by marine tsunami sand carried inland by a wave, then estuarine mud as the downdropped land silts up with tidal deposits. You can verify this for yourself–it’s still there. Had a weekend place in Ocean Park on the Long Beach Peninsula for about 10 years. We had neighbors who had an old Navy lifeboat made of concrete, had reserved seating just in case. The other option was to grab a good bottle of scotch and a cigar, climb up on the roof and watch it coming. There was no way you were getting off the Peninsula. Nothing like a relaxing hanging-wall bulge to create room for even further tsunami inundation, as is proven by successive tsunami overwash deposits cored all along that coastline. Climate that. My guess is that anything that NOAA has such as a tide gauge is not acceptable. Why? It is “White Man Science”. Quinault know Earth, Water and Sky. Quinault Intelligent! White Man dumb”! White Man thieve! White Man murder! Quinault will take White Man money! Then Kill White Man! It is good for Quinault. Great Spirit will be happy again. They should be used to this. After all, their ancestors had to adjust several times to the flooding of the land bridge they came over on. Just bought property at Ocean Shores where we plan to spend the part of the year when mosquitoes carry away where we are now in Louisiana. My wife was worried about our chances of evacuating in tsunami. I said zero. If safe evacuation is a criterion, visiting family in Louisiana is out because of tornadoes. It is always something. I would prefer the kids tell a story of mom and dad being swept away in a tsunami than wasting away in a cancer ward. We enjoy the nomadic life. If you do not like where you are at, move. For $60 million they could build a helluva an ocean front casino and loot those Microsoft pale faces for many moons. Once the big one hits they’ll already have a condo in HI. I realize climate alarmists are unlikely to spend much time following the science because it rarely supports their agenda, but this is interesting reading on the paleoenvironment of the Pacific Northwet Coast. And no, I didn’t misspell that. This is the wettest place in Washington. It is also where a lot of silt went that was picked up when glacial lake Missoula carved out the scablands of eastern Washington. That kind of silting has not occurred since. the next 9.0 mag Cascadia earthquake will drop the Olympia Peninsula by around 10 feet in a out 3-4 minutes of rolling ground waves… then 15 min later a 40 foot high tidal surge will destroy whats left. Climate change claims are merely a hook to try to get more money to move to safer ground. I would imagine it’ll be considerably cheaper after the quake. And you’ll also be able to see if it is under water. do see this report from senior military figures from several nations (not likely to be leftists or government influenced, I would suspect). “Top-ranking military officers are warning that climate change could severely impact global security as sea levels rise and prolonged droughts grip poorer nations. Ongoing conflicts sparked by drought are fuelling both extremist groups and increased refugee flows, as seen in Syria. Says it all. The Syrian civil war is obviously not “sparked by drought”, but by US supported terrorists. The only remaining question is why Gen. Middendorp can’t tell tell the truth? Ah yes, everything bad is caused by the US. It’s impossible for you to believe that Asad is a brutal dictator and that there are people in his country who would like to see him gone. No, it’s all because the US. Seriously Griff. Why would you think military leaders are any less ill-informed about climate change than you are? And in the case of the navies, they have to pay some attention as most of the hundreds of billions of US dollars/Euros/Yuan/etc they have invested in facilities is, of necessity, located very close to sea level and everyone agrees that sea levels are rising a bit. If you are going to build a new wharf or shipyard or whatever that may be in use for centuries, the question of whether it will remain above water should possibly be of some concern. Why don’t you save that for posting under a more appropriate thread, where it is the topic of discussion? You always seem to want to derail the thread. Top ranking military figures are not politically influenced? Griff, just what drugs are you taking and are they legal in your country? Move to one of those countries, before they get wise. This one must be the sea wall, I guess. It fits with all the other up-is-down logic we’ve put up with in recent years and administrations. It’s time for a whathaveyou fill-in-the-blank grant. A hundred years earlier, Billy Balch, a leader of the Makah tribe, recounted a similar story. Before his own time, he said, all the water had receded from Washington State’s Neah Bay, then suddenly poured back in, inundating the entire region. Those who survived later found canoes hanging from the trees. In a 2005 study, Ruth Ludwin, then a seismologist at the University of Washington, together with nine colleagues, collected and analyzed Native American reports of earthquakes and saltwater floods. Some of those reports contained enough information to estimate a date range for the events they described. On average, the midpoint of that range was 1701. As noted above separately, plus many for this additional comment. ‘Evidence’ comes in many forms. Some not traditionally ‘scientific’, yet still valid. This comment reminds of the medical search for herbal remedies among ‘shamen’, which amongst others has led to the newish discovery of artemisinin against malaria. The willow bark extract acetylsalicylic acid (aspirin) being the first such. I see that there was a sequel to the New Yorker article, entitled “How To Stay Safe When The Big One Comes“. More good stuff. The word “precaution” is mentioned zero times in this article. Precaution only applies to climate. We spent a weekend at Westport a few months back. rented a condo online, When we got there the beach erosion was about 20′ from the back door. It had chewed up roughly 80′ of the dunes in less than a year. COE had refused any type of seawall to save the development. The funniest part was walking along and finding old tree trunks buried 10′ to 15′ below the sand dunes, exposed by the recent erosion..No one wants to talk about how they got there in the first place. As an occasional visitor to Tahola I can’t help but wonder if the motivation for this scam is to find someone else to pay for their failing local infrastructure (the whole town is a dump) or to pay for relocation. Driving through the third world wasteland that is Tahola never ceases to depress me. About 43 miles south of Taholah is a place called Washaway Beach. There is much information on this area. One of the ideas is that many years ago a source of sediment became depleted or in some other way lost. The changes can be documented but not back to a first cause. This is a very active coast. That’s not news. The big worry for the area is a full or major rupture along the Cascadia Subduction zone. Deaths and refugees will be plenty. Last time was January, 1700. Now that I’ve looked at more of the comments I note others have covered the big quake. I’ll just add that Brian Atwater has an excellent presentation. And he’s a nice person. If you have the chance, go hear him.